Tina's Crop Shop: SIP #31 Birthday Theme - Look who's turning 29 again! 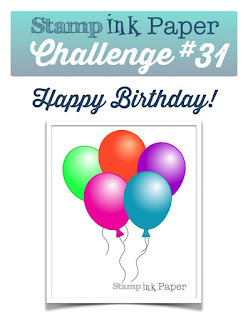 SIP #31 Birthday Theme - Look who's turning 29 again! Hello and Happy Tuesday! On the 29th of January, my sweet daughter, Christine, will turn 30! 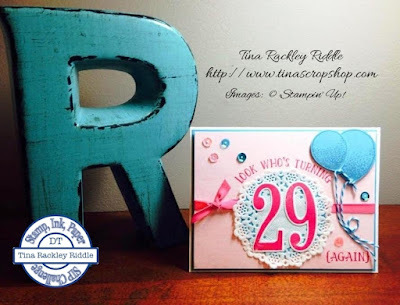 So when this week's Stamp, Ink, Paper Challenge was announced as a birthday theme I was super excited! Finally, I have a chance to be ahead of the game! lol Seriously you'd think as many cards as I make that I would always have a card ready but the truth is I really like the cards that I give friends and family to be personal. So here I am with the opportunity to have her card made way before I need it! Yay for me! Now the truth is, Christine is not taking this birthday too well! She is beginning to feel.... you guessed it, OLD! So I thought this was the perfect stamp set for her card! 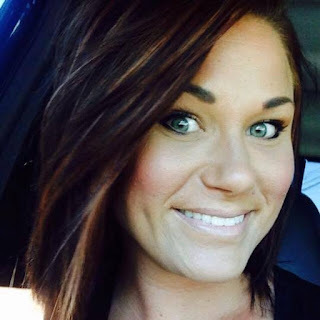 So here is my beautiful, sweet daughter, Christine! And here is Christine's card. I love how it came out and hope she does too! The colors I used were Pink Pirouette, Melon Mambo, and Tempting Turquoise on a Whisper White Thick card base. The white doily under the numbers was Doodlebug as were the sequins. This card is beautiful Tina, but not as beautiful as your sweet daughter! You must be a very proud Mom, and I'm sure she'll love this card.